This site, the blog posts I do, the articles I write, the vlogs I record and everything else; are all dedicated to the goal of helping people with disabilities, anxiety and depression. Not only is the goal to help them gain confidence, but to help show them that they donâ€™t have to settle for what society tells them to do. People without these issues get to party hard, experience the dating scene freely, travel where and when they wish and go on all kinds of crazy adventures with obnoxious shenanigans. Itâ€™s a part of being young; yet I rarely see articles about how to do these things IF YOU DO HAVE THESE ISSUES! Thatâ€™s where I come in ;). 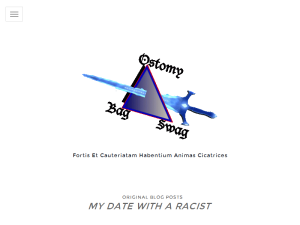 This what your Ostomybagswag Blog Ad will look like to visitors! Of course you will want to use keywords and ad targeting to get the most out of your ad campaign! So purchase an ad space today before there all gone! If you are the owner of Ostomybagswag, or someone who enjoys this blog why not upgrade it to a Featured Listing or Permanent Listing?